10Here’s an interview published in a special edition of the Dauphine Libéré’s “Recettes et Saveurs” review last October. Interview by Patrick Peltier (images by Bruno Moyen). For the entire article ans new recipe suggestions, click on the link at the bottom of the page. “Situated at the confluence of two valleys – the Ardoisière and Manche valleys – Morzine has lost nothing of its age-old connection with the mountains and the families that made it what it is, akk the while cultivating a chocolate-box image that our British friends appreciate especially. It’s at the heart of this village that Thierry Thorens can be found pursuing his many passions. 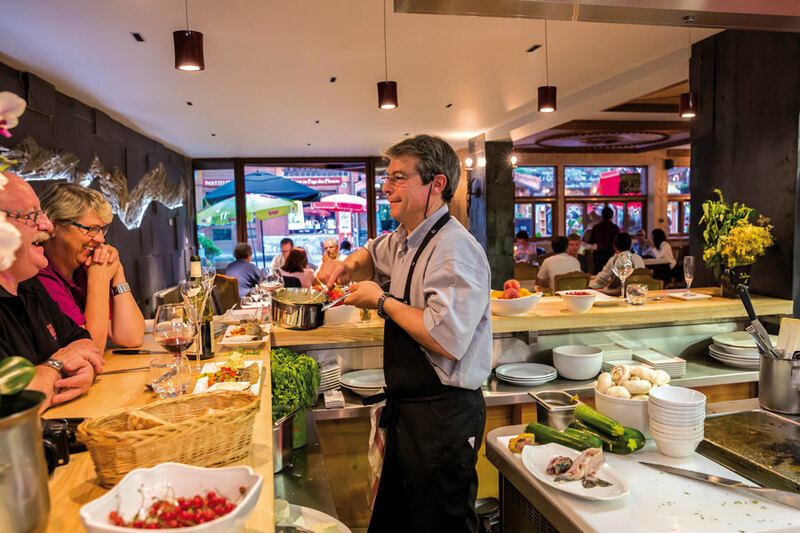 Patrick Peltier : La Chamade restaurant is being renovated: are the kitchens and ovens too limiting for you ? Thierry Thorens : I’ve invested more than €2 million to ensure that La Chamade restaurant is ready for the winter. In 1969, my mother’s hairdressing salon was turned into a pizzeria / creperie where families could come after a day’s skiing. Since then, La Chamade’s story has continued to unfold. The wine bar has been open for many years already. Today, I want to cook in front of our guests and serve dishes that have a strong mountain identity. So the kitchen will be open for all to see, if you like, a new take on the French “dine with your host” formula. Our cheese bar will offer the best produce from high-altitude meadows as well as a selection of British cheeses, in recognition of our British links. Do you intend to continue making recipes that marry up regional flavours with local produce, and also offer pizzas and cheese fondues ? T.T : My guests enjoy a mix of cooking styles. My parents and my grandparents taught me how to spot authentic foods. Like them, I’m very aware of texture. I aim to offer cooking that gives diners the opportunity to discover the flavour of the mountains. Is it difficult finding local foods ? T.T : The know-how to make it exists, but we need to encourage small independant producers, market gardeners, free range chicken and pig breeders. We can find good products but there are supply issues. It’s actually becoming more and more difficult to find a pig that hasn’t been reared industrially! You have to pay to get quality local products – within 30km – and respect strict rules on hygiene. What’s your stance on where local cooking begins ? T.T : For me, cooking that reflects its region should be on offer in restaurants in autoroute lay-bys. That’s where it should all begin. These places are the first port of call, and these restaurants should be a showcase for our cooking tradition. Places like Point in Vienna and André Pic offered exceptional cooking on the famous Nationale 7 autoroute for people heading off on holiday. What’s your favourite season ? T.T : I like to vary my cooking according to the seasons. Do you have a passion for writing ? T.T : I like to write and share things. After recipe books on vegetables, rice, fruit, spices and flowers, I’ve written a new book for publisher Actes Sud. It focuses on how to cook poultry and eggs and contains 300 original recipes, such as duck chilli with sweet chestnuts, roast goose with dried and fresh fruits, or even fried eggs with a nut and parsley parmesan pesto, or tapendade of hard-boiled eggs and split peas with juniper. I write for hearty eaters and food-lovers. My son Jules is also a chef and has just finished training with Michel Rochedy.